This is the V18.0 Map European DVD for for E (W211), CLS, SLK (R171), SL (R230), Maybach, S/CL (W220/W215) in the boot / trunk. It is put into the navigation DVD drive in the boot (trunk) of the car. It is not suitable for cars that have a CD that only covers one to three countries in the head unit (see our Navigation CD section) and not suitable for the latest MY2009 facelift cars that have a built in hard disk. This disk has coverage for the following countries: A, AL,AND, B, BG, BIH, CH, CZ, D, DK, E, EST, F, FIN, FL, GB, GBZ, GR, H, HR, I, IRL, L, LT, LV, MC, MK, N, NL, P, PL, RO, RSM, S, SK, SLO, SRB, V.
Updated navigation data for the COMAND APS (NTG1) navigation device. Albania, Andorra, Belgium, Bosnia-Herzegovina, Bulgaria, Denmark, Germany, Estonia, Finland, France, Gibraltar, Greece, Great Britain, Ireland, Italy, Croatia, Latvia, Liechtenstein, Lithuania, Luxembourg, Macedonia (FYROM), Monaco, Netherlands, Norway, Austria, Poland, Portugal, Romania, San Marino, Sweden, Switzerland, Serbia, Slovak Republic, Slovenia, Spain, Czech Republic, Hungary and Vatican City. The 2017/2018 version covers the whole of Western Europe. The navigation data on the 2017/2018 version covers over 10.2 million kilometres of road throughout Europe. In Eastern Europe, there is full coverage of the Baltic states, Greece, Croatia, Poland, the Slovak Republic, Slovenia, the Czech Republic, Hungary, Bulgaria and Romania. Prime Coverage* has been significantly extended in the following countries: Poland: + 2 percent, Slovenia: + 6 percent, Hungary: +2 percent. There is, for the most part, full house number coverage in central and northern European countries, while coverage has been improved in the following countries: Bulgaria: +5 percent, Serbia: + 16 percent. Almost 2.7 million key points of interest are featured on the DVD, including filling stations, car parks, museums, restaurants and hospitals. There are around 76,000 more POIs here than on the previous version. If required, the navigation system will also show the user the quickest route to 2996 Mercedes-Benz service outlets. Some 10,961 restaurants and 3,079 nightlife destinations have been added to the new 2017/2018 version. Using the data from the Traffic Message Channel, the navigation system takes into account the latest motorway traffic bulletins and automatically calculates diversions. This convenient service is now available in 38 countries. Map updates include millions of changes, e.g. new roads, crossroads, bypasses, junctions and motorway slip roads and exits. One section of road may feature up to 260 attributes, such as the number of lanes or one-way routing. All of these attributes and the vast number of points of interest have to be updated constantly. In this new version, for example, over 70,727 roundabouts, 558,989 turning restrictions, 61,803 one-way streets and 1,114,281 street names have been updated. In addition, over 2,032,622 kilometres of road have been updated, including approximately 1,808 sections of motorway and dual carriageway. The 2015/2016 version covers the whole of Western europe. The navigation data on the 2015/2016 version covers over 9.9 million kilometres of road throughout Europe. - in eastern europe there is full coverage of the Baltic states, Greece, croatia, Poland, the slovak republic, slovenia, the czech republic, Hungary, Bulgaria and romania. - intensive work means that the quality of the maps for Bulgaria has been significantly increased (20,154 km Prime coverage*, compared with 18,468 km in the previous version). - The 2015/2016 version features 90,789 towns and communities. hospitals. There are around 200,000 more POIs here than in the previous version. • Some 3434 restaurants and 6755 nightlife destinations have been added to the new 2015/2016 version. If required,the navigation system will also show the user the quickest route to 2996 Mercedes-Benz service outlets. Using the data from the Traffic Message Channel, the navigation system takes into account the latest motorway traffic bulletins and automatically calculates diversions. This convenient service is available in 10 countries. • Map updates include millions of changes, e.g. new roads, crossroads, bypasses, junctions and motorway slip roads and exits.One section of road may feature up to 260 attributes, such as the number of lanes or one-way routing. All of these attributes and the vast number of points of interest have to be updated constantly. • In this new version, for example, over 71,025 roundabouts, 202,802 turning restrictions, 48,755 one-way streets and 1,056,341 street names have been updated. In addition, over 1,906,460 kilometres of road have been updated, including approx. 1925 sections of motorway and dual carriageway. Germany, Austria, Switzerland, Liechtenstein, the Netherlands, Belgium, Luxembourg, France, Monaco, Spain, Andorra, Gibraltar, Portugal, Italy, San Marino, Vatican City, Denmark, Sweden, Norway, Finland, United Kingdom, Ireland, Czech Republic, Slovak Republic, Hungary, Greece, Estonia, Latvia, Lithuania, Slovenia, Croatia, Poland, Bulgaria and Romania. • Almost 1.2 million key points of interest are featured on the DVD, including Filling stations, Car parks, Museums, Restaurants and Hospitals. There are around 175,000 more POIs here than on the previous version. • 18,138 Restaurants and 15,249 Hotels have been added to the new 2010/2011 version. The navigation system can also, if required, show the user the quickest route to 2,679 Mercedes-Benz service outlets. • Dynamic route guidance based on the latest traffic data (TMC/RDS): Using the data from the Traffic Message Channel, the navigation system takes into account the latest motorway traffic bulletins and automatically calculates diversions. Details can be found in the appendix to this issue of the Telematics News. • Road and house number coverage per country The option of being guided directly to the required house number has also been extended. 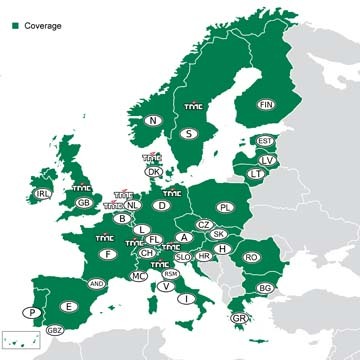 There is, for the most part, full house number coverage in central and northern European countries, while coverage in France has been improved by 20% and in Croatia by 11%. All our disks are the genuine article. "Just a quick line to state that I am very happy with the service and the uncommonly kind price you offered me for the tv screens. Wishing you well..."